This is less known command of DraftSight. This is used for Text editing of Note and Simplenote. In-place: This is default option to open Note editor when we run NOTE command. 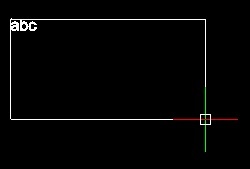 Try running Note command and select first and opposite Corner points and In-place Note editor will open. Dialog box: Lets try second option for Note Editor. 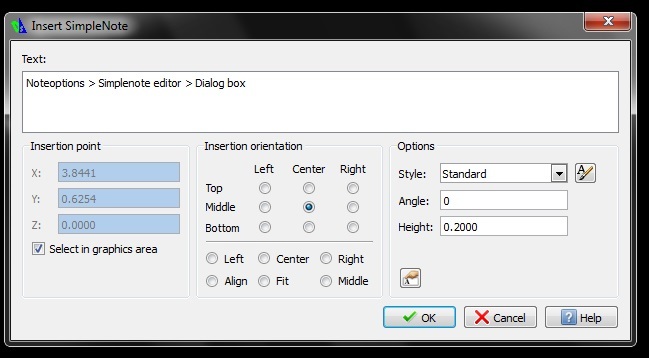 Run NOTEOPTIONS command and Select option ‘Note Editor’ then ‘dialog box’ and enter. Now run Command NOTE and specify first and opposite corner. External editor: Run NOTEOPTIONS command and Select option ‘Note Editor’ then ‘External editor’ and enter, command line will ask to ‘Specify editor’ here You have chance to open external Text editor or Notepad from DraftSight (You can open Notepad in AutoCAD with NOTEPAD command) . Type ‘~’ and Enter ‘Browse for File’ dialog box will open. Specify Notepad.exe path select and click ‘Open’. Now run NOTE command and select First and opposite corner point in GA. Notepad will open. Type text in it and Click close and Select Save option. You will see text in GA.
Dialog box. This option will open Dialog box of Simple note if we run command Simplenote or click on Command Tab. In-place: This option will not open any dialog box or text editor and you will have to Specify start position, height and text angle to type any text using ‘simplenote’ command. If you click anywhere in GA then this simplenote command will end. Advance: This is DraftSight default option for Simplenote. When you use this option for Simple note then you need to specify start position, height and text angle first time then you can type text in GA. If you click anywhere in GA then simpenote text box will appear at that place and command will continue. To end command press Esc key or enter. Tip: To open Simplenote Formatting Editor in Simplenote command. Right click when you are in command , Go to ‘Editor Settings’ > Show Toolbar. This diaplay options are for In-place text editor. As defined. Use this option if you want to see text as it is. This option is not suitable for small size text and it will be too difficult to read. Easy readable. This is more convenient option to read text. This option will temporarily enlarges very small text and rotates it if necessary. When you are specifying First and Opposite corners in GA then this option will show some sample text in Specifying Window. If you select ‘.’ that means none and no sample text will be shown when in place editor. However, you can set your own sample text for this . This sample text will take Active text style in Drawing. Now run NOTE command and you will notice mouse cursor with sample text. This text is for reference and now shown as a Note text in GA.